P. alleghaniensis of Michigan Flora. 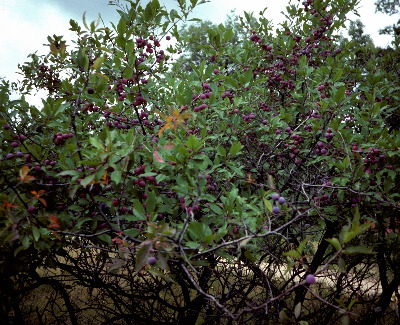 A shrub 2 m tall or less in forests of jack pine and oak, open savannas, or sandy plains; occasionally at borders of mesic forests, fencerows, and roadsides. Plants from Michigan have been named as Prunus alleghaniensis Porter var. davisii (W. Wight) Sarg. Our plants are disjunct from the main range of the species from southern New England south to the southeastern States and need further study. MICHIGAN FLORA ONLINE. A. A. Reznicek, E. G. Voss, & B. S. Walters. February 2011. University of Michigan. Web. April 19, 2019. https://michiganflora.net/species.aspx?id=2515.